When Insects Attack - The Chip's Challenge Wiki - The Chip's Challenge Database that anyone can edit! Yellow bugs turn left at every opportunity and paramecia turn right at every opportunity. Dirt and gravel block monsters. 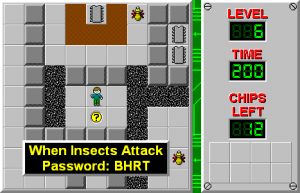 When Insects Attack is the 6th level in Chip's Challenge Level Pack 1, and the sixth of the lesson levels. This level specializes in bugs and paramecia and how they interact with other tiles around them, such as dirt and gravel. Cut through the area above the starting point to get the chip being circled by a yellow bug, then continue along the outer wall until you reach the two chips behind the dirt where a paramecium can be found. You need to wait  before clearing the second dirt tile - the safest way of doing this is DUL. Clearing this dirt tile will cause the paramecium to get stuck looping indefinitely, so you can go around the edge of this room collecting all the chips with no trouble. By this point you should have three chips remaining to collect. The first you'll go for is the one in the center area with the fire; since we've waited so long to pick it up, the bug will not get in our way. The two chips left are both at the bottom of the level; the first one to get will be the one on the right, which we can get without interference from the monsters. Collect the final chip and run for the exit. 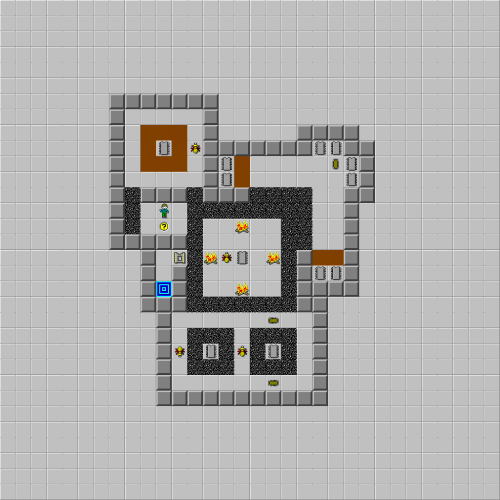 In TS_Tutorials, the level set which this level originated from, the level was simply titled Bugs and Paramecia.